Use to connect a USB peripheral device (flash drive, mouse, keyboard, game controller, printer, etc.) 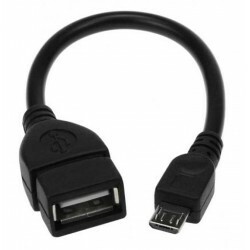 to a USB OTG smartphone, tablet or Micro USB device. Use with a USB hub to expand the number of USB peripheral devices. Compliant with USB 2.0 standards. Plug-and-play connection for OTG-enabled mobile device. Compatible with Android 3.1 and higher.